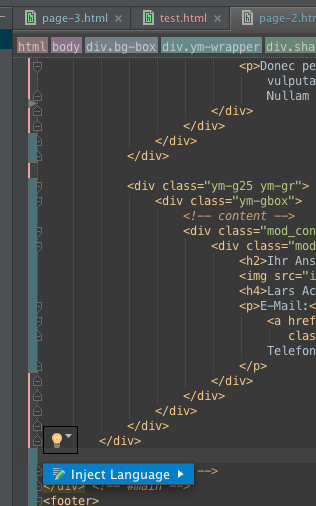 i've been using phpstorm for two months now but i don't get the zen coding / emmet working. i've enabled it in settings > emmet ("Enable Emmet") and tried it with all possible keys (tab, enter, space) for "Expand abbreviation with". nothing worked. i've seen that "Live Templates" has the same key setting ("Tab") - could this make problems? 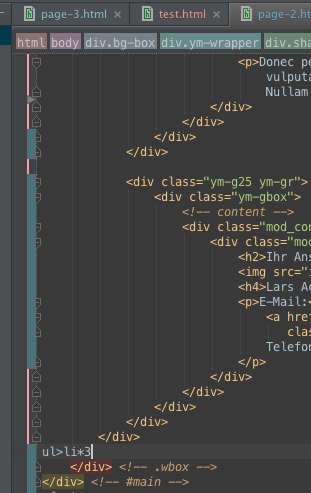 i would really love to use emmet in phpstorm, but i don't get it. is it a bug or am i doing something wrong? thank you for some tips. Looks like it's misconfiguration / settings on your end. What that green background inside the whole <body> tag? If you place cursor just after <body> and press Alt+Enter on it, what do you see (screenshot please)? I made a screenshot like you said. And i appended two further screenshots of an older html file out of my project. Here the effect after pressing "Tab" ist different: the row (ul>li*3) dissappears and a light bulb symbol appears. I clicked the symbol so you can read the tip. I'm referring here to your first screenshot. On your other screenshots I do not see such background .. so cannot comment for all of them. Go to "Settings | Language Injections"
Look trough all custom entries there (the one that has "global" or "project" in last column -- ignore "bundled"). Disable all of them (for now -- you can re-enable most of them later). If you post screenshot of that settings screen here I may be able to tell which one maybe messing thing up (I believe it is the reason). 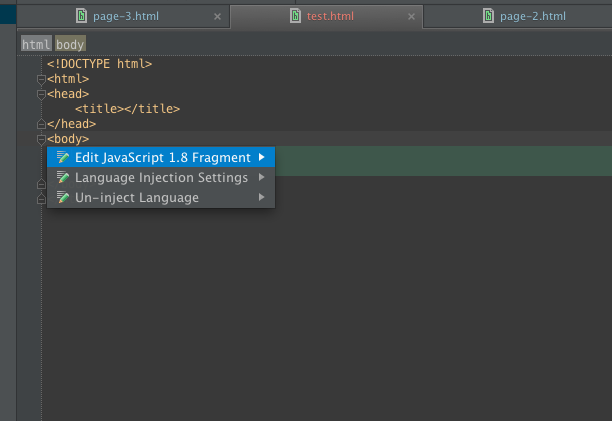 You may just choose "Uninject Language" from that Alt+Enter menu -- it should work as well. 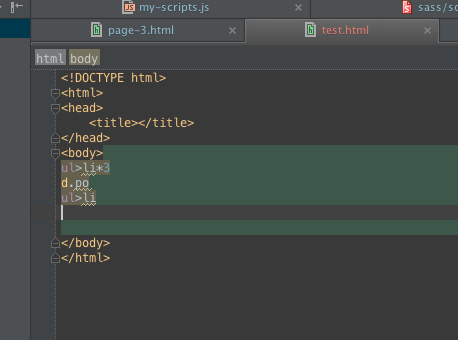 But it just disables that single entry in Language Injections, while going manually trough them may reveal other possibly conflicting injections that you may have there (since I do not see green backgound on other screenshot, but that possibly due to the actual color scheme). For now i just tried ""Uninject Language", but also in the other document (other screenshots) it works now!